It's a new issue! Number 23 of The Broken City—"a series of tubes"—is now available for download on the Current Issue page. Also head to our Submissions page for details on our upcoming summer 2019 edition. It's a new issue! 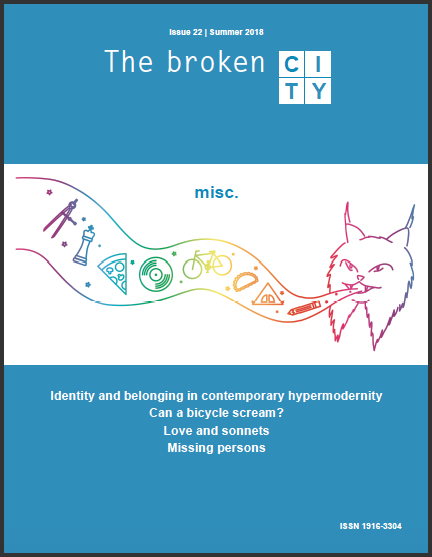 Number 22 of The Broken City—misc.—is now available for download on the Current Issue page. Also head to our Submissions page for details on our upcoming winter 2018 edition. 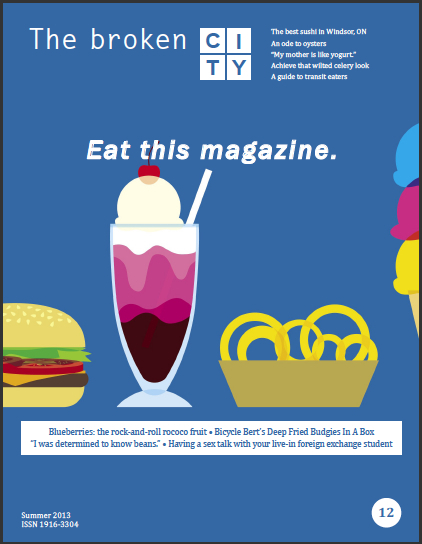 While you're waiting on our tardy summer issue (we don't want the good times to end! ), head to our submissions page to check out the call for Issue 23. December 1 deadline. Update: The Broken City's summer 2018 issue will be arriving in the near future. It may be a fall issue. We've been busy skinny dipping and planning beer busts at the moon tower. It's a new issue! Number 21 of The Broken City—Hurry! 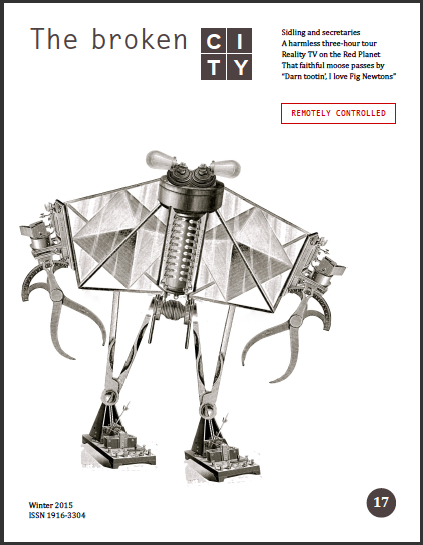 Hard!—is now available for download on the Current Issue page. Also head to our Submissions page for details on our upcoming summer 2018 edition. Weather Advisory: The Broken City's winter 2017 issue has been slightly delayed due to the extreme cold and a software malfunction. It will be arriving soon. It's a new issue! 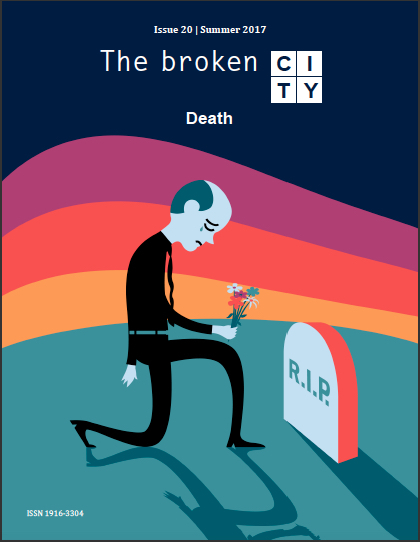 Number 20 of The Broken City—Death—is now available for download on the Current Issue page. Also head to our Submissions page for details on our upcoming winter 2017 edition. The submission window for Issue 20 has closed. Please stop sending us things; we're busy stockpiling booze and fireworks for Canada Day. Submitters will be contacted in the coming months with news of acceptance or rejection. It's a new issue! 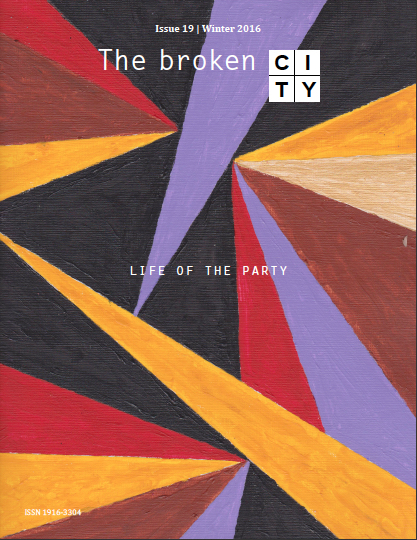 Number 19 of The Broken City—Life of the Party—is now available for download on the Current Issue page. Also head to our Submissions page for details on our upcoming summer 2017 edition. The submission window for Issue 19 is closed. It's getting cold outside and there was a draft coming in (we know, we've used that pun before, but it's a good one). Submitters will be contacted shortly with news of acceptance or rejection. It's a new issue! 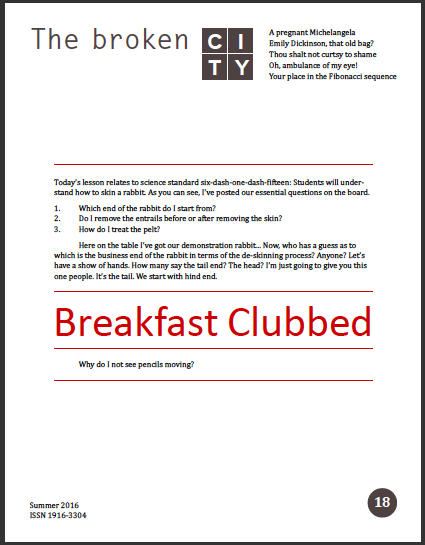 Number 18 of The Broken City—Breakfast Clubbed —is now available for download on the Current Issue page. Also head to our Submissions page for details on our upcoming winter edition. Issue 18 will be arriving soon. In the mean time, check out the submissions page for details on our upcoming winter 2016 issue: Life of the Party. It's a new issue! Number 17 of The Broken City—Remotely Controlled—is now available for download on the Current Issue page. Also head to our Submissions page for details on our upcoming summer edition. The submission window for Issue 17 is closed. It's getting cold outside and there was a draft coming in. Submitters will be contacted shortly with news of acceptance or rejection. Submit to Issue 17. All your friends are doing it. We'll be accepting submissions until November 1; you'll find other pertinent details on the Submissions page of this site. It's a new issue! Number 16 of The Broken City—The truth is out there—is now available for download on the Current Issue page. Also head to our Submissions page for details on our upcoming winter edition. Issue 16 will be arriving soon. In the mean time, check out the submissions page for details on our upcoming winter 2015 issue. It's a new issue! 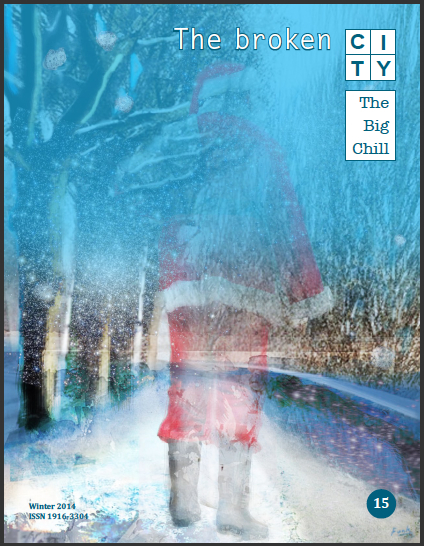 Number 15 of The Broken City—The Big Chill—is now available for download on the Current Issue page. Also head to our Submissions page for details on our upcoming summer edition. The submission window for Issue 15 is closed. If you're looking for a way to pass the time while you await your acceptance/rejection letter, the magazine suggests you read this splendid article: What Editors Want: A Must-Read for Writers Submitting to Literary Magazines. After that, why not follow The Broken City on Twitter? You read that correctly; the magazine finally opened a Twitter account, and it needs friends. You'll find us listed as @brokencitymag. It's a new issue! 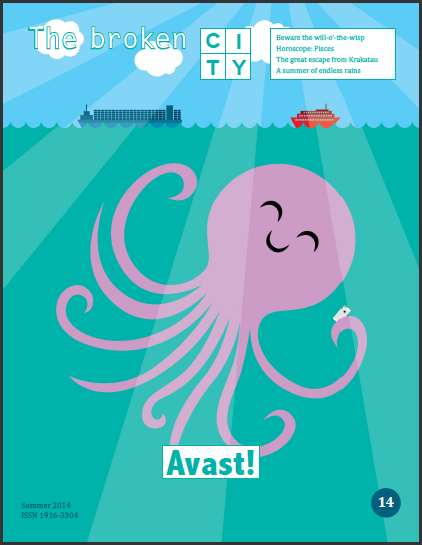 Number 14 of The Broken City—Avast!—is now available for download on the Current Issue page. Also head to our Submissions page for details on our upcoming winter edition. It's a new issue! 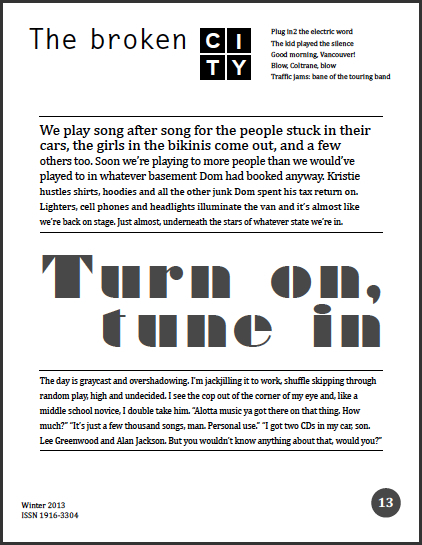 Number 13 of The Broken City—Turn on, tune in—is now available for download on the Current Issue page. You can also read it on your mobile devices, via issuu. The submission window for Issue 13 is now closed. Please stop sending us things; we're busy baking fruitcakes and reading poetry about Steely Dan. Submitters will be contacted shortly with news of acceptance or rejection. Submit to Issue 13. All your friends are doing it. We'll be accepting submissions until December 1; you'll find other pertinent details on the Submissions page of this site. It's a new issue! Number 12 of The Broken City—Eat this magazine. —is now available for download on the Current Issue page. You can also read it on your mobile devices, via issuu. Issue 12 will be arriving soon. In the mean time, check out the submissions page for details on our upcoming winter 2013 issue. The submission window for the summer issue is closed. Submitters will be contacted in a few weeks with news of acceptance or rejection. Stay tuned to the Submissions page for details on our upcoming winter 2013 issue. The Broken City's e-mail account was hacked last night; if you received a message from the magazine that looks like spam, it is. Delete it. Real e-mails from The Broken City will always include witty banter. It's a new issue! Number 11 of The Broken City—Reunion—is now available for download on the Current Issue page. Also head to our Submissions page for details on our upcoming edition. The Broken City: interviewed. Check out the magazine's chat with Six Questions For... and learn how you (yes, You!) can slip between our covers. Countless valuable insights are revealed, sentence after sentence! It's a new issue! 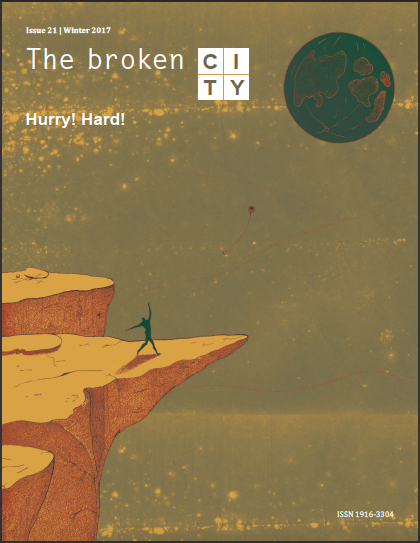 Issue 10 of The Broken City—The Future—is now available for download on the Current Issue page. Also head to our Submissions page for details on our upcoming editions. The submission window for Issue 10 is closed. Please stop sending things; we're busy reading poetry about space ships and working on our beach bodies. Submitters will be contacted in a few weeks with news of acceptance or rejection. The Broken City is still accepting submissions for its upcoming issue, The Future. Head to the Submissions page for details. Deadline: June 1. It's a new issue! Issue 9 of The Broken City—This is why I drink—is now available for download on the Current Issue page. 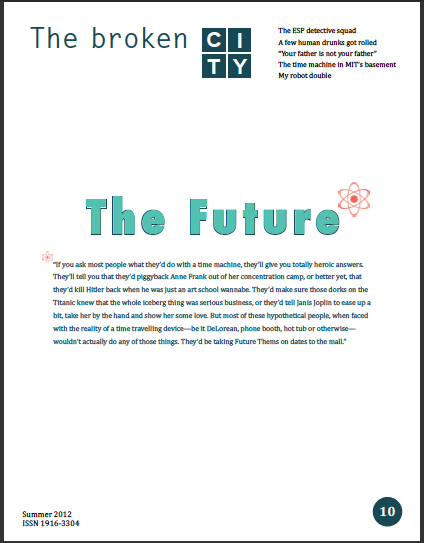 Head to our Submissions page for details on our upcoming summer 2012 issue: The Future. The submission window for Issue 9 is closed. Please stop sending things; we're busy growing moustaches and stuffing our winter coats with rejected poetry. Submitters will be contacted within the next few weeks. Stay tuned to the Submissions page for details on our upcoming summer 2012 issue. It's a new issue! Issue 8 of The Broken City—Reality bites—is now available for download on the Current Issue page. Head to our Submissions page for details on our upcoming winter 2011 issue: This is why I drink. 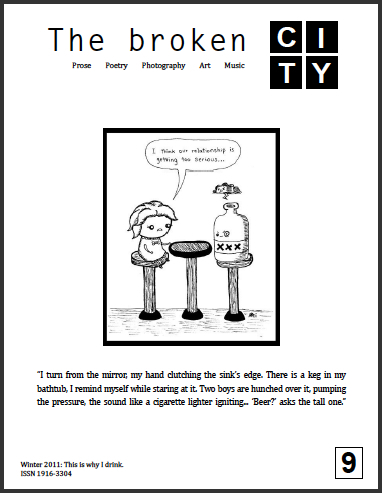 The Submissions page has been updated with details on our upcoming winter 2011 issue: This is why I drink. Commence submitting! The summer issue will be hitting electronic newstands within the next couple of weeks. The submission window for Issue 8 has closed. Please stop sending things; we're busy going to NXNE shows and building a stockpile of fireworks for Canada Day. Submitters will be contacted within the next few weeks with news of acceptance or rejection. Stay tuned to the Submissions page for details on our upcoming winter 2011 issue. The Broken City is still accepting submissions for its upcoming issue, Reality Bites. Head to the Submissions page for details. A friendly message from The Broken City: Do not add The Broken City to your group mailing lists. The magazine does not want to receive news about your upcoming events or announcements that your blog has been updated. It's a new issue! 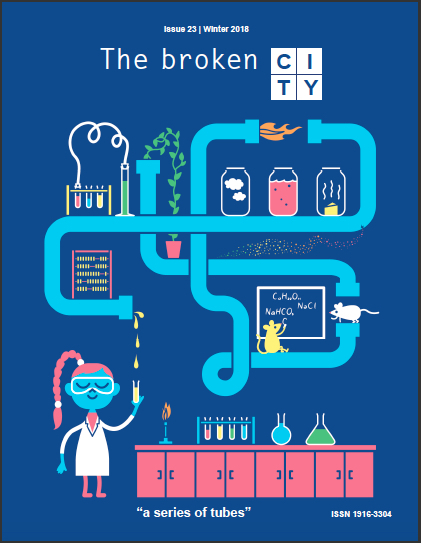 Issue 7 of The Broken City—Found!—is now available for download on the Current Issue page. 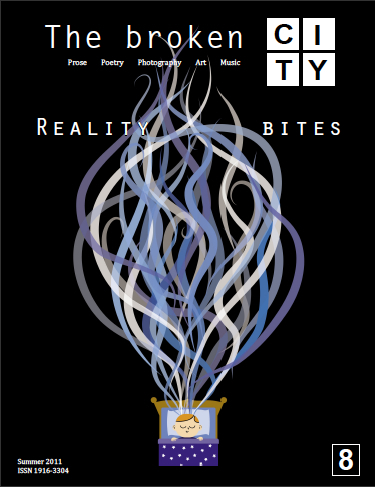 The Submissions page has been updated with details on our upcoming summer 2011 issue: Reality bites. Commence submitting! 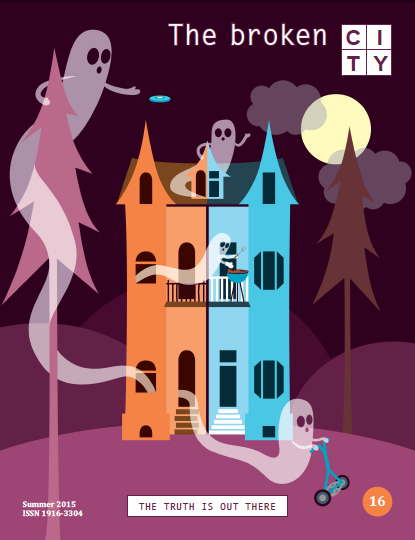 The submission window for Issue 7 closes at midnight EST tonight. Please stop sending things; we're busy reading poetry and sharpening skates. Submitters will be contacted within the next few weeks with news of acceptance or rejection. Stay tuned to the Submissions page for details on our upcoming summer 2011 issue. Canzine Toronto is almost upon us: Sunday, October 24, at The Great Hall. The Broken City doesn’t have a table (it’s in the public’s best interest; we’re not pleasant people to chat with), but we’ll be wandering around, buying wicked merch and drinking beer—assuming it’s provided. If it isn't, we'll be the ones flipping tables. We’re still accepting submissions for our upcoming issue (check out the Submissions page)—deadline is Nov. 15. It's a new issue! 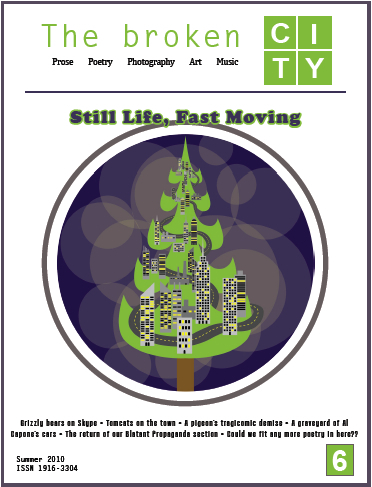 Issue 6 of The Broken City—Still Life, Fast Moving—is now available for download on the Current Issue page. 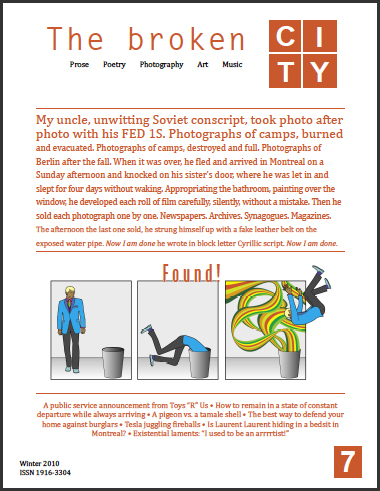 The Submissions page has been updated with details on our upcoming winter 2010 issue: Found! Commence submitting! The submission window for Issue 6 has closed. Please stop sending things; we're busy reading poetry and celebrating Canada Day. Submitters will be contacted within the next few weeks with news of acceptance or rejection. Stay tuned to the Submissions page for details on our upcoming winter 2010 issue. The Broken City is still accepting submissions for its upcoming issue, Still Life, Fast Moving. Head to the Submissions page for details. It's a new site! thebrokencitymag.com has undergone some serious reconstruction. It is now a sparkling jewel of the Internet. In this front page news section, you'll discover up-to-date information on The Broken City and also be made privy to announcements and select tidbits of news from across the literary landscape.